First, two stories about a couple of long-distance cycling pioneers, which come to us thanks to the Adventure Cycling Association's BikeBits newletter. This past Sunday marked the 98th birthday of Athens, Georgia resident Fred A. Birchmore, who in 1934-35 made a round-the-world trip of 25,000 miles by bicycle, then followed that up with a 12,000-mile bicycle tour of North America in 1939. 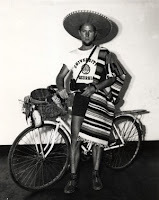 Later that same year, he and his new bride topped it with a 6,000-mile bicycling honeymoon in Latin America! His other accomplishments include an extensive arrowhead collection (many of which he found while walking the Appalachian Trail from Georgia to Maine), weight-lifting champion, and walking on his hands, a skill he once demonstrated on the steps of the Washington Monument! Read more about "Fred The Great" in this article from the Athens Banner-Herald. Another pedaling pioneer, Anne Mustoe, passed away on November 10 in Northern Syria while on the latest of several around-the-world bicycle trips. She set out from London on her first round-the-world journey in 1987 at the age of 54, getting on a bicycle for the first time in 30 years with virtually no touring experience. This and her subsequent journeys led to her writing several books about her travels. Read more about this tenacious woman in this article from the London Times. A bicycle sitting on top of a Subaru at the recent LA Auto Show so impressed a Wired Magazine columnist that he named it the "Sweetest Ride" of the whole show. The bike was a singlespeed mountian bike made by Minnesota-based bike builder Rawlands. Check out more pics of this sweet ride and the whole story here. 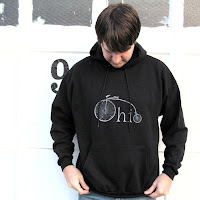 Finally, check out this Ohio Bike Hoodie from small-time t-shirt and handbag makers Alison Rose, based in Columbus.